Episodes 101-103 of the entertaining science series. 101. 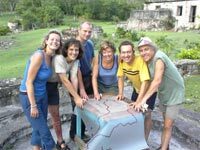 ALL MAPPED OUT - Kate Humble and the team of five scientists take up the challenge of charting the sights and sounds of their tropical island. Starting from scratch, they must make an accurate scale map, botanical paper and inks, and a sound-recording device. While a very good head for math and plenty of versatile local plants get them started, impassable mangrove swamps and tropical downpours soon seem intent on scuttling their plans. 102. BUGS AND BAROMETERS - The team has to pit their wits against nature - and bugs - in the latest challenge. Can they get a biology lab, microscope, and weather station built and tested on their tropical island in just three days? With only a basic kit of tools to work with, the island's plants and seaweed have to be employed - and predicting the weather can be problematic under the best of conditions. 103. TIME AND TRANSMITTER - The scientists find they have to borrow some wartime tricks when challenged with building a transmitter and radio - but will they be able to communicate across their tropical island base? There's also a portable clock and a botanical kite to design and, once again, the natural plants and resources the scientists find on the island get their thoughts running in strange new directions. "ROUGH SCIENCE may be the most fun anyone ever had learning science." "ROUGH SCIENCE dares to be genial and collegial, operating on the assumption that intellectual stimulation is not an exclusionary game... ROUGH SCIENCE resembles a 'Survivor' for smart people." "This show helps viewers learn that we all solve problems." "The premise of the show is that . . . knowledge will . . . rub off on the viewers while they are being entertained." The DVD series has the following special features: * How the Rough Scientists solved the challenges. * Background scientific information on the challenges. * Chapterized by challenges. * Interviews with the scientists. * Relevant web sites and books for each challenge. * pdf files for easy downloading. "The fascinating series Rough Science demonstrates exactly how I think science should be approached - functional application...Treat yourself the DVD versions; they will re-pay the investment over and over...These films represent a tremendous resource in providing 'real life' knowledge and valuable information to homeschooling families - not just the children, but parents too. Watching them together is a great way to spend an evening."